I had the pleasure of participating in an Internet conference with parents in Australia about the social and emotional needs of gifted children. “My own experience (and I suspect that of many other parents of gifted children) is that my awareness of giftedness came about after becoming a parent. She went on to say: It’s something I’ve noticed in my discussions with other parents — while many of them accept their child’s giftedness and associated traits, they seem to be in “denial” about their own giftedness, or at varying stages of dealing with it. Michelle’s comments are not unusual. Frequently parents and teachers express concerns about fostering growth in gifted children while dealing with the often painful process of coming to terms with their own giftedness and potential. It is difficult — a sort of developmental double-whammy — to go through your own developmental phases while at the same time teaching, guiding, and/or parenting gifted children. Giftedness in adults can be viewed through a number of lenses. and learning practical coping skills. In order to improve self-esteem and self-efficacy, it is vital for adults, as well as children, to have a firm affective foundation from which to act. By focusing on these five needs, adults can begin to foster their own giftedness and will become better role models for gifted children by showing them the importance and value of addressing personal strengths and needs. The first step towards building a strong social and emotion base is to recognize and acknowledge one’s own strengths or gifts. For many adults this facet of who they are has either gone unnoticed, been ignored or was not expressed for cultural reasons. So, if you have not already done so, take time over the next few days to list your personal assets. Look at those around you whom you believe are gifted. What characteristics do you share with them: intense curiosity, keen sense of humor, creative or artistic bents, sensual or emotional sensitivity, intense imagination, deep concerns about social issues, tenacious academic abilities, superior interpersonal skills, etc? If this is a difficult task for you, ask your partner, friends, children, family. Seek their input and validation. The next step is to be honest with yourself and then open with others about your own concerns or confusion surrounding your giftedness. How do you feel being different from your friends, family, cohorts at work? How do you feel about talking openly about your strengths? How do your gifts enhance your life? How do they make your life more complicated? Self-evaluation, asking these questions, should enable adults to feel more comfortable with who they are and to become more willing to share themselves with others. This openness leads to modeling for children, pride in our assets, and a willingness to work on our weak points. Often gifted adults, out of compassion or obligation, focus on the development of their children, students or partners while ignoring their own. As Michelle said, “They seem to be in “denial” about their own giftedness, or at varying stages of dealing with it.” This leads not only to inappropriate modeling for children, but also to unmet needs as an adult. Allying oneself with others of similar interests, passions, overexcitability, talents, etc. Making an active effort to meet your needs for validation, affirmation, affiliation, and affinity, is instrumental to fostering adult giftedness. Another facet of the process of meeting your own needs is to give yourself permission to be a person in a growth process. Try to accept personal imperfections and recognize that growth tends to move through peaks and valleys rather than on a straight progression upwards. Many gifted individuals are born with a sense or understanding of how things (ideas, morality, justice) should be. They see more possibilities, imagine greater outcomes, and have loftier ideals than others. They can see from an early age what perfection looks like. As a result, their peers, teachers and significant others, hold inappropriate or overly inflated expectations for them. These expectations, whether directly stated or implied, are sensed by the individual and he/she responds by trying to be perfect in order to meet the expectations of others. Understanding the innate characteristics which may accompany giftedness also helps to foster adult giftedness. The work of Kazimierz Dabrowski (1902-1980) provides an excellent framework in which to understand the supersensitivity or overexcitability frequently found in the intellectually or creatively gifted. Dabrowski described overexcitabilities (OEs) as a heightened ability to receive and respond to stimuli. Found to a greater degree in the creative and gifted, overexcitabilities are expressed in increased sensitivity, awareness, and intensity, and represent a real difference in the fabric of life and quality of experience. Dabrowski identified 5 areas of intensity — Psychomotor, Sensual, Intellectual, Imaginational, and Emotional. A person may possess one or more of these OEs. Individuals with these characteristics view the world through a different lens. They are often perceived as people who overreact or are just too intense. It is this turbulent, complex and rich inner experience that can be a blessing or a burden to the intense, gifted person and those around them. As a beginning, accepting that OEs are hereditary and are part of a person’s essence has a remarkably freeing and validating effect. The next step is to recognize that individuals with discrepant OE’s sense they are speaking in different languages, or operating from different perspectives, or dealing with different cultures relative to their colleagues, friends or family members. * Mutual respect, credibility, and understanding may be hard to establish or maintain because there is a lack of shared experience or reality. * Finding a common language to describe experience and express needs is difficult and takes a great deal of work. * Others may be perceived as warped or psychologically damaged and thus incapable of holding up their part of a relationship. * Values may differ greatly creating fractures in a relationship. * Finding common areas of interest or passion may be difficult. * Respect and honor individual differences. * Model acceptance of differences. * Adjust expectations to incorporate individual differences. * Assume that the reality described by the other person is OK — Try not to automatically look for pathology. * Be sure both people in the relationship are knowledgeable about OE’s. * Reframe for one another. Try to describe your experience in a way that makes sense to the other person. Use metaphors, examples from literature, art, theater, the animal kingdom, etc. * Seek like people to provide the emotional, intellectual, imaginational, sensual, physical support you are unable to get within the relationship. * Remember that overexcitabilities are innate abilities which need to be accepted with grace as one would accept shoe size, or handedness. The first four affective needs of gifted adults can be greatly facilitated and enhanced by incorporating two basic coping skills: recognizing and dealing with stress, and learning effective communication skills. The two sets of skills are vital because they help individuals deal with the increased stress, intensity, and feelings of differentness which are often outcomes of being gifted. Everyone deals with stress on a daily basis. But frequently gifted individuals have increased stress reactions because of their psychomotor, sensual, intellectual, imaginational, and emotional makeup. There are many programs and books about stress reduction. (1) learn to identify your own stress symptoms: headache, back ache, pencil tapping, pacing, etc. (3) develop strategies to prevent stress: make time for fun, develop a cadre of people to help, advise, humor you, become more tolerant of your own and others’ imperfections. Good communication skills are useful on multiple levels, from improving the chances of getting what you want, to nurturing and facilitating growth in others. Regardless of one’s motivation for learning these skills, the outcomes will include less stress, greater self-acceptance, greater understanding from and about others, and less daily friction at home, work or in the grocery store. When learning communication skills be sure to include both verbal — listening, responding, questioning, telephoning, problem solving (Faber and Mazlish, 1980) and nonverbal — rhythm and use of time, interpersonal distance and touch, gestures and postures, facial expressions, tone of voice, and style of dress (Nowicki, 1992). Verbal and nonverbal skills improve interpersonal communication and help individuals better fit in when they wish to, try to change the system if necessary, and most importantly treat themselves and others respectfully. 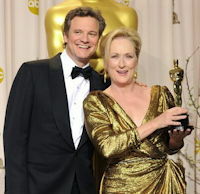 Faber, Adele and Elaine Mazlish. 1980. How to Talk So Kids Will Listen and Listen So Kids Will Talk. New York: Avon. Lind, S. (1994.) Understanding intensity in gifted children. CAG Communicator (Journal of the California Association for the Gifted), 25, (5), 22-24. Lind, S. (1996). Teaching about overexcitabilities in the classroom. The Dabrowski Newsletter, July, 1996, 3-4. Mahoney, A.S. (1998). In search of the gifted identity: From abstract concept to workable counseling constructs. The Roeper Review, Vol. 20, No 3, 222-226. Nowicki, Stephan et al. 1992. Helping the Child Who Doesn’t Fit In. Atlanta: Peachtree Publishers. Adderholdt-Elliot, Miriam. 1986. Perfectionism – What’s Bad About Being Too Good. Minneapolis: Free Spirit Publishing. Hipp, Earl. 1985. Fighting Invisible Tigers. Minneapolis: Free Spirit Publishing, 1985. Margulies, Nancy. 1991. Mapping Inner Space: Learning and Teaching Mind Mapping. Tucson:: Zephyr Press. Simon, Sidney. 1988. Getting Unstuck: Breaking Through Your Barriers to Change. New York: Warner Books. Watts, Jean. 1990. In Search of Perspective. Columbus, OH: Ohio Psychological Publishing Company. Sharon Lind is a gifted education and parenting consultant in Washington state. 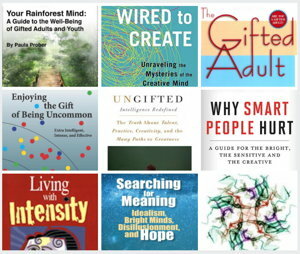 Also see article Overexcitability and the gifted by Sharon Lind. Article: Talented People and Stress: ChokIng From Memory Distraction – includes audio clip by psychologist Sian L. Beilock on high ability students, testing and choking. 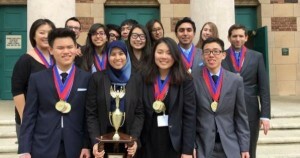 More Articles: High Ability – gifted/talented. 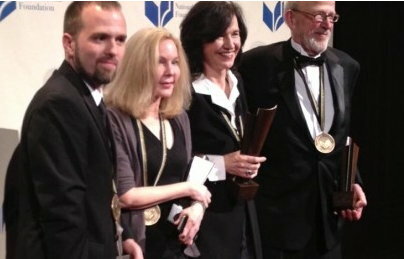 Photo 2 from article: 2012 National Book Awards: An Evening for Readers. Photo 3: Gordon Parks and David Lynch – see article: Multitalented Creative People. “Living in a society and a world that does more than disparage smartness, that actually silences smart people (because the power and privilege of leaders is undercut by smart people like you pointing out fraud, illogic, and injustice). 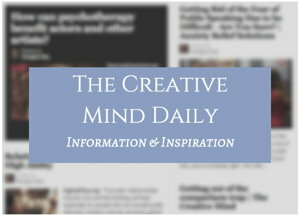 See more in article: Brainpower and The Smart Gap. One of his related books: Why Smart People Hurt: A Guide for the Bright, the Sensitive, and the Creative. 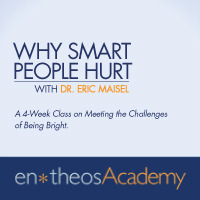 His Academy for Optimal Living online course: Why Smart People Hurt.